Today, The Football Front interviews an American based football fan, Maria Xing, on her exciting experiences of seeing her favourite stars and clubs play in America. Hi Maria, thanks for coming on and talking about your experiences this pre season. Hello, it is an honour to be interviewed by The Football Front! Thanks for having me on here. So, what teams did you see this summer in America? I saw quite a few teams this summer actually. Club: Liverpool, Roma, Tottenham, New York Red Bulls, Chelsea, PSG, Real Madrid, Milan, Lyon, Montpellier. International: Mexico, Wales, Argentina, El Salvador, and Brazil. Which games did you enjoy the most? As I’m a Liverpool fan, I enjoyed the match against Roma the most. It was great to see the Redmen play despite the end result. The Argentina v. Brazil match was absolutely surreal; I witnessed Messi scoring a hat-trick right in front of my eyes. Real v. Milan was also a great match, ended in a 5-1 rout. As most people who follow you on Twitter know, you are a huge Liverpool fan and you had the chance to interview a LFC player and watch the reds train, how amazing was that experience seeing the reds in that zone? I can’t put it into words. Phenomenal. Mind-blowing. I’d only been to one other match in my lifetime, so seeing them in the flesh again was unbelievable. Attending the training sessions was interesting because I was able to witness first-hand the personalities of the players. I recall watching Fabio Borini and Steven Gerrard sharing a nice bonding session. It made me smile! The interview opportunity I had with Jack Robinson was brilliant as well. I sat down with him, Liverpool’s Director of Communications, and Head of Press. It was so cool to be surrounded by all these people who represent the club I love. Were there any Liverpool players who you really excited to meet? If I had to pick one, it’d be Stevie. I’m sure my fellow American Reds would agree. I met him outside the training ground, and the place was absolutely electric when he arrived. He’s such a nice guy. He made sure to sign everyone’s shirts and take pictures with all his fans before leaving. I told him he was my hero and he thanked me. I was also really excited to meet Lucas, Agger, Sterling, and McLaughlin. Lucas was very impressive last season and has grown on me. He’s got a great sense of humour as well! Agger’s just a hero – I wish I could have seen his “YNWA” tattoo on his knuckles though. Sterling and McLaughlin are two youngsters who I had talked to prior to the tour, so I was excited to finally meet them. It’s funny, really. They even recognized me! I was also pretty pumped to meet Robbie Fowler and Ian Rush, who attended one of the training sessions and played a friendly against Harvard staff. 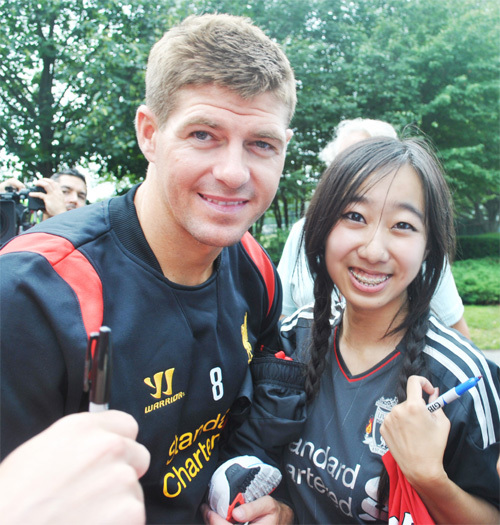 Besides Liverpool players, did you get the chance to speak or take pictures with any other players? Yes! My second favourite team is AS Roma and I was lucky enough to attend their meet-and-greet in Boston. I was able to take pictures with the team and get my shirt signed. I also got the chance to speak to the Brazil and Wales national teams, Chelsea, Real Madrid, and Lyon. What non –Liverpool players did you really enjoy meeting this pre season? 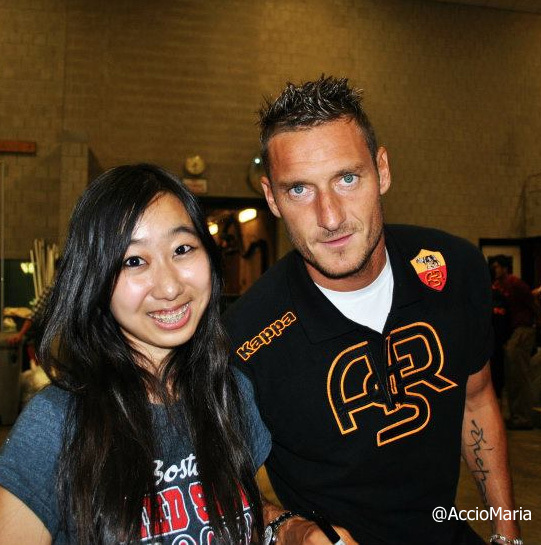 I loved meeting my idol Francesco Totti. He’s just a legend, no other way of putting it. It’s rare to find someone who loves his club as much as he does. Same goes for Thierry Henry, I loved watching him play for Arsenal back in the day. Who else? David Luiz was a top #geezer, Nuri Sahin was incredibly nice (this was before he joined Liverpool), Aaron Ramsey and Bojan were sweethearts - I could go on and on. Also, it was cool discussing transfer activity with some of the players. After Kenny Dalglish left Liverpool, the manager job remained vacant for a while. I met several Swansea players during that time and asked them what they thought of Brendan Rodgers leaving their club. Ashley Williams said that Rodgers was “brilliant” and didn’t want him to leave, and Jazz Richards agreed with him. I told Andy Carroll not to go to Newcastle, which I guess he listened to as he left for West Ham instead. Nuri took my advice and joined Liverpool, whereas Hugo Lloris didn’t when I told him not to leave Lyon. I guess my scouting work didn’t have a 100% success rate, shame! Meeting footballers in the flesh is of course different to what you see and expect on the television, did some players surprise you with their personality and behaviour? Some did and some didn’t. The footballer who didn’t surprise me at all was Cristiano Ronaldo. I know he donates to charity and occasionally demonstrates acts of kindness, but his personality was unimpressive. There was a fan who asked to take a picture with him and he completely ignored him. The fan proceeded to jump over a barricade and force him into taking a picture; it got pretty ridiculous. There were some Liverpool players who surprised me with how nice they were. For example - I’d witnessed a lot of Aquilani abuse before he had left the club, but he was an absolute gentleman. Did you find it surreal or even a bit weird to be amongst the superstars of the game? Yes, absolutely. I found it surreal every time I met a different footballer. You’d think that I would’ve gotten used to it, but I didn’t. I’d spent most of my life watching these players on TV and the next thing I know, bam! They’re standing right in front of me. As a football fan based, in America, do you think clubs spending their pre season in USA has benefited American soccer and the interest the sport generates? Definitely. I saw all kinds of people at the matches I went to – long-time fans, fans of other clubs, people who don’t normally watch football, etc. The variety was incredible. It was beautiful to see them unified, all enjoying one match and cheering on one team. Do you feel, clubs should do more to appeal and reach to their fans overseas? 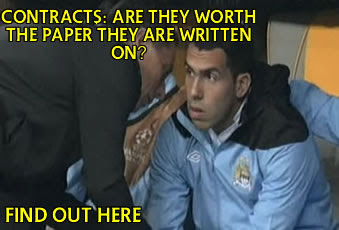 It’s the foreign fans who bring in a lot of the club’s revenue and make them prosper. As a whole - if a club wants to be bigger, then they definitely need to do more to appeal and reach out to people overseas. It’s a win-win situation really. Foreign fans don’t get the same opportunities as local ones do: many can’t afford to travel all the way to Liverpool to watch matches. It’s great that the team goes out on tour and provides them with that chance. So in this section, for a bit of fun, you have to answer the question with one word! 2.) 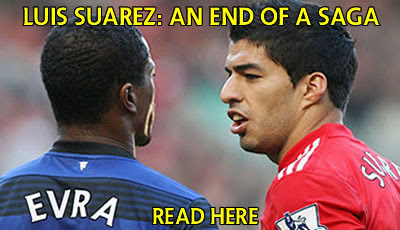 Torres or Suarez – Suarez! No worries! Again, thanks for interviewing me.